Just What Is in It for Your Customer to Do Business with You? What is in it for your customer to do business with you? How do you answer that question? Do you answer that question from your customer’s point of view? Find out what customers want from marketing in What’s in It for Me? 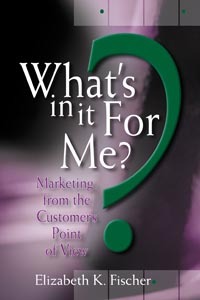 Marketing from the Customer’s Point of View released by Monarch Tree Publishing Inc. Discover the secret to unlocking the hidden treasure within your customers about your business. Learn how to use what you learn to do more profitable marketing and to increase the profits in your business. The Atrium Bed and Breakfast. Part 1 What’s in It for Me? You may buy the book in print 19.95 includes shipping and audio $14.95 plus sales tax.